Hey there, Gameologeteers. You may have noticed that we’ve yet to review XCOM 2. Well, that’s because we didn’t get a copy until a few days prior to release. When he’s not manning the Newswire, William Hughes is working tirelessly to break the grasp Earth’s alien overlords, but he still needs a little more time. Having played some XCOM 2 myself, I thought it would be fun to check in with someone who’s been fighting the good fight for much longer and could shed some light on my burning questions. Matt Gerardi: My first question, William: Does it get easier? William Hughes: Depends. Does it get easier than losing every single soldier on the first tutorial mission, which seems to be the norm (including for me)? Yeah, but not a lot easier. Even more than the first game, it really, really wants you to worry about where your guys are in relation to the enemy, hence the Concealment system, which can save you a lot of pain when you set up good initial ambushes. It also still has that quirk from the first game, where unseen enemies aren’t really “there,” so the slower you move, the fewer foes you have to face at once. But learning to move slowly gets countered by the fact that there are a lot of timed missions—like more than half of them. So that’s putting pressure on you to move, even when it’s not always safe. MG: Yeah, the frequency and stringency of timed missions is definitely the biggest change since the last game, if you ask me. In many cases, you’re punished for playing how I’m used to playing XCOM—as methodical and careful as possible. Here, you have to run and you have to take risks if you’re going to get everyone out. On one mission, I successfully extracted the VIP I was sent to rescue on the last possible turn, but none of my soldiers made it to the chopper in time. I passed the mission, but it turns out my entire team was left behind and captured by aliens. It was very weird seeing a desolate helicopter fly back to base while triumphant music played in the background. Have you felt yourself having to adjust? WH: The new classes help a lot with that. 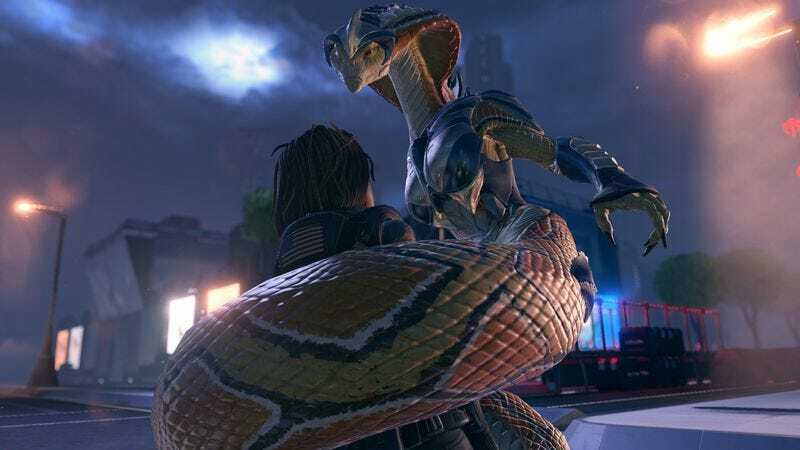 The Ranger, XCOM 2’s answer to the Enemy Unknown’s Assault class, is built really well to get out front while still staying safe—either by turning invisible or gaining an ability that counters enemy melee attacks, which there are way more of in this one. My new favorite class, the Specialist, meanwhile, lets you nail a lot of the objectives without exposing yourself to fire via remote hacking with their drone. That being said, I failed my first mission last night: a Retaliation, XCOM’s version of the last game’s Terror missions. I just couldn’t get to enough civilians in time without getting my guys killed. If I were going to save enough civilians to pass, it would have left my team so badly wounded that I’d be unable to field a crew for at least a month. And given how scarce manpower is in this game, it wasn’t an acceptable risk—especially not when the clock is ticking. Even after I failed, I still had to clear all the enemies, and once the mission was over, I was treated to a very sad Skyranger ride home, a withering “I’m sure you did your best” from the shadowy Council guy, and I lost contact with the region (which wasn’t actually all that bad, because it cleared up my communications to start moving toward a region that needed more attention). MG: People have always lauded XCOM for presenting so many interesting, excruciating choices like that. Does it feel like the developers have really doubled down on that characteristic to you? Everything just seems so dire all the time. WH: Absolutely. “Do I cover a little more ground, and risk bringing another squad down on my head, or hang back and risk blowing the mission?” It hits even harder on the macro level: Every research project is a major commitment of your precious time. Meanwhile, you only get enough cash each month to build, at most, one or two new rooms or upgrades for your squad’s equipment. (One of the neat changes is that when you build, say, new armor, the order contains enough units to outfit an entire squad, so you’re picking a full-team upgrade, not just something for one soldier.) So suddenly you’re prioritizing like crazy: Do I get better guns? Open up Psi attacks? Expand my squad size? And the Avatar Project timer is always up there at the top of the screen, ticking forward, while the enemies that show up on missions just get meaner and meaner—and more diverse, which might be my favorite aspect of the sequel. Each species of enemy feels like a new, interesting challenge. MG: That does seem like it would be a pretty big divergence from Enemy Unknown, where the strategy, for me at least, was pretty much always the same regardless of what you were facing down. WH: I think that’s why the first mission comes as such a roadblock for people. You’re not expecting a Sectoid when that first one shows up; you’re expecting a regular infantry guy. Then the Sectoid uses its psychic powers to resurrect the dead and mind control one of your dudes. It’s a wake-up call to tell the player that enemies’ special abilities have been emphasized really hard in XCOM 2. Now, if I see a Viper, I know I’ve got to kill it quick, before it yanks one of my soldiers into melee range and wraps them up. The game has a couple of nasty tricks designed to play on the player’s natural instincts, which, again, is what I like: I have to adjust my tactics depending on what I’m facing, which is a big step up from Enemy Unknown. MG: One of the fun things about Enemy Unknown was that you got to name and customize the look of all your soldiers, so a lot of people run campaigns with themed teams. My Enemy Unknown troopers were all styled after American presidents, for example. Do you have a theme going? WH: I tend to name my guys on the “Space Mutiny” principle, which means a name is fine if it would have come up in the “Big McLargehuge” run from the Mystery Science Theater episode “Space Mutiny.” Current squad members include Dirk Buttflex and Beef Thunderchunk. I never claimed to be mature. I haven’t dug that deep into the physical customization options for the characters, but I do appreciate how diverse they can look. I’ve got a Specialist with a bandana over his face, and it’s always cool to see him pop up on the “Wanted” screens that show off your top troopers in ADVENT cities some times. MG: That sounds like a perfect system for naming your digital cannon fodder to me, especially in a game this nasty. It’s best to not get attached. WH: Yeah, I haven’t actually lost any troopers yet, because I’m an obsessive save scummer, but I don’t want to watch, like, my best friend or girlfriend get repeatedly shot in the face. MG: Well, William, thanks for taking the time to talk to me about the game. It sounds like you’re enjoying yourself, even if most of your time with it is spent being stressed the hell out. WH: Oh, yeah, it’s the best persistent nervous breakdown I’ve played since Darkest Dungeon. Thanks, Matt! MG: I’m going to go ahead and assume that’s a sarcastic thank you, since that’s my fault. WH: Only a little; the Stockholm syndrome’s set in pretty well at this point.